Right at the base of Petrin Hill is lovely new playground to replace the wooden one that existed in this spot for many years. 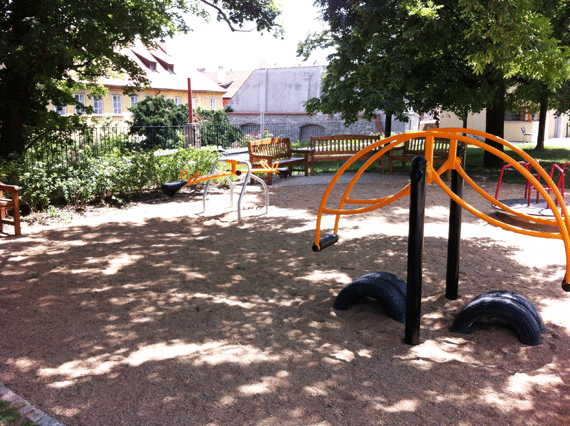 This playground is great for tourists and locals out for the day with kids, it’s also a very handy spot as it has brand new, clean toilets - which is like finding gold in this part of Prague. Petrin Hill is a wonderful place to walk and observe the city, you can find some really quiet spots up under the trees that bear blossoms in Spring and fruit in Summer - it’s the perfect place for a picnic. Pathways criss-cross the hill and snake down to Mala Strana below. If you have kids it’s best to walk from the top of the hill down - I walked straight up from the base of the hill to the top to the other day and was quite exhausted, good cardio workout though. 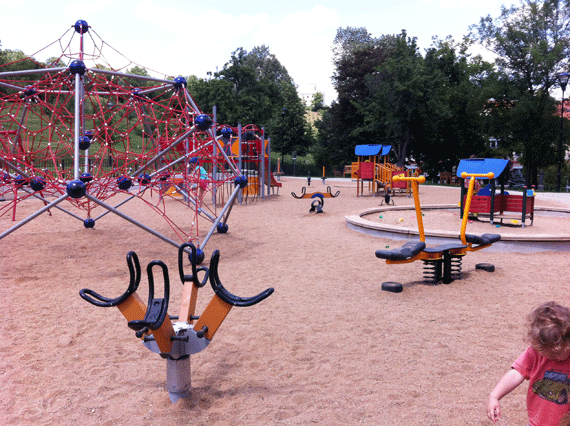 Petrin Hill has a few small playground areas dotted around it but this newly reconstructed one is the biggest by far. It has a large range of equipment for kids of all ages. 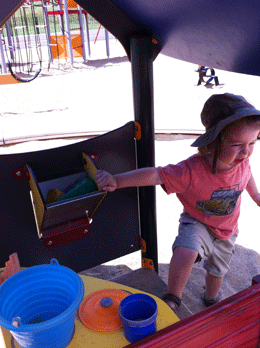 Ari enjoyed playing on the smaller climbing frames, especially the one with the telescope - pretending he was a pirate at sea. This area can get quite hot during Summer and unfortunately most of the equipment is in full sunlight without shade. 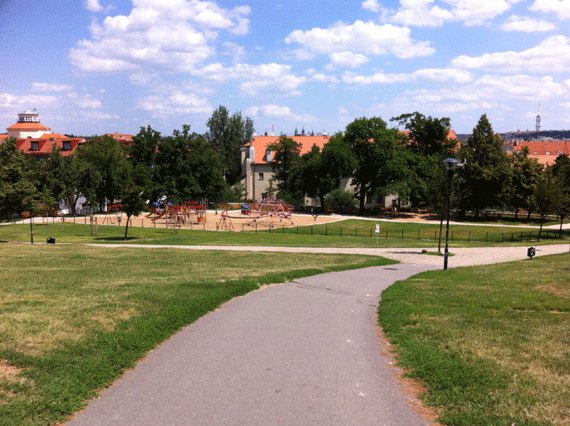 It would be good to have shade cloth over some of the area as they do at Hlavni Nadrazi playground. There is some parts under the shade, especially seating. One of the best features are quite a few heavy benches and tables set up underneath trees for picnics. Another point of interest is the funicular tram (that the playground is named after) which runs past the playground on it’s way to Petrin Hill - my kid’s love watching this strange tram that manages such a steep incline and descent. 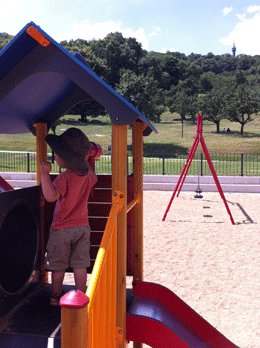 The playground is now fully-fenced and with round-the-clock supervision to ensure standards. This supervisor sits in a building where the toilet block is, be warned though, these toilets are only for families who are using the playground. DIRECTIONS: By Tram: Take tram numbers 6, 9, 12 or 20 to tram stop Ujezd or 12, 20 or 22 to Hellichova and walk in the direction of Petrin Hill, the playground is at the base of the hill between the Funicular and Hellichova Street. By Metro: Closest metro is A line to Malostranska, then take the 12, 20 or 22 to Hellichova. By Car: If you need to drive then try for a spot in the direction of Andel, this area (Prague 5) has no parking restrictions.